Now, Shout! Factory is releasing a (nearly) complete set of Ernie's two-season (1959-61) anti-game show, Take a Good Look, after offering select episodes in an earlier, limited-edition release. The 49 episodes included in Shout! 's new 7-DVD "Definitive Collection" of Take a Good Look represent all the surviving episodes of the show. Certain segments in these episodes reveal evidence of tape damage and decay, so presumably the few missing episodes were totally beyond salvaging. So what is Take a Good Look? A fair question, but one that is not easy to answer. On the face of it, Take a Good Look is a panel game show in the vein of What's My Line?, where a trio of celebrity panelists must guess the identity of a variety of guests who have gained some sort of prominence. Usually it's something that would have led to them being profiled in Life magazine or in the middle pages of the newspaper. Something like that. The panelists are given three clues, in the form of comic sketches devised by Ernie (and usually acted out by him, Peggy Connelly, and Bobby Lauher). As each clue passes without a correct guess from the panel, the guest gets more money, maxing out at $300 if the panel totally bombs it (which they often do). That's all well and good, except that Ernie makes his "clues" willfully opaque, burying the pertinent ideas under a morass of silliness. For example, one extended bit casts Ernie as a used flying carpet salesman. It ends with Peggy Connelly flying one of the floor models straight up, complete with fire extinguisher foam approximating exhaust. The solution of the clue is supposed to be "float," and the guest turns out to be the queen of that year's Tournament of Roses parade. Get it? Float, like a parade float? Yeah, well, the panel didn't get that one either. 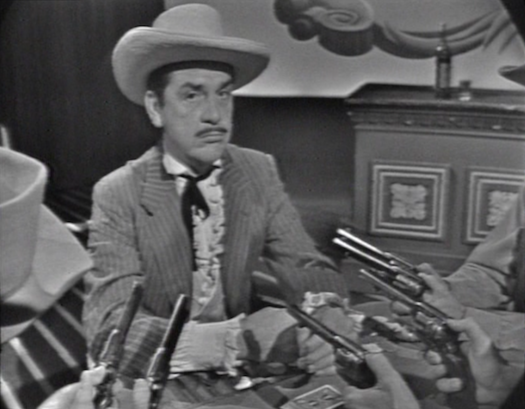 In early episodes, the show alternates between letting the audience in on who the mystery guest is and leaving us in the dark to try to figure out Ernie's weird sketches with the panel. Clearly, some notes from higher-ups were given at some point, and eventually Ernie reveals the identity of all the guests in advance. In certain episodes, he also explains in advance precisely what his weird clues are supposed to indicate. These concessions, rather than totally dumbing down the show, help we viewers to focus on the true pleasure of Take a Good Look: watching the celebrity panelists flounder while Ernie harangues them for either over-thinking or under-thinking the clues. Character actor and the voice of Disney's Captain Hook, Hans Conried, makes for a perfect befuddled antagonist, getting nearly apoplectic when the clues barely make sense, let alone seem to be indicating anything. In one glorious moment, he cries out exasperated, "If I could think of a question, don't you think I would ask it!?" Former leading man and future Batman villain Cesar Romero also makes for an entertaining opponent against Ernie. Rather than trade jibes like Conried, Romero takes a more studied approach and often tries to outwit the feisty and sometimes fiendish host. Ernie's wife, Edie Adams, is usually the third panelist, and more often than not, Ernie spends so much time flattering her about how good she looks in the countless designer dresses she wears on the program that her allotted time runs out without her getting in too many solid questions. While Conried, Romero, and Adams are the most frequent panelists -- the "classic panel," as I'd like to think of them -- numerous other personalities cycle in throughout the show's two-year run, such as Janet Leigh, Jim Backus, Carl Reiner, Mervyn LeRoy, Anne Jeffreys, Ben Alexander, Tony Randall, Marie Wilson, Pat Harrington, Jr. (in character as fake Italian golf pro Guido Ponzini), and Zsa Zsa Gabor. 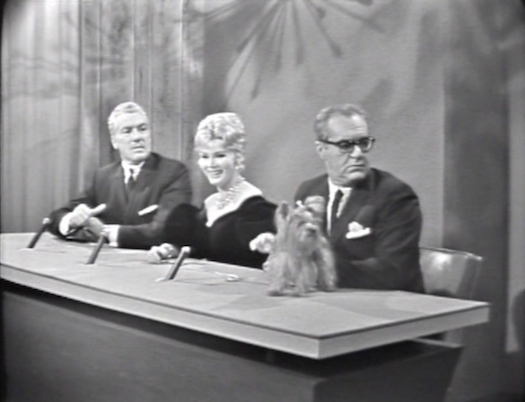 One of the show's early highlights involves a small dog that Zsa Zsa decides to bring onto the panel with her, who barks at the clues, especially a film clip of a cat feeding on a poor goldfish. The game, while being the ostensible reason for the program, becomes more and more tangential as time goes on, as Ernie seems to delight in watching the game show format disintegrate before his very eyes. He frequently refuses to explain the rules of the game at the top of the show. At one point, we are treated to an extreme close-up of an orange pierced with pencils, only to have the announcer reveal that this image has nothing to do with anything. By the end of the program's short run, Ernie was conceiving sketches for the sake of banking them for future TV specials, with Ernie's best-known characters, the lisping poet Percy Dovetonsils and German disc jockey Wolfgang Sauerbraten, making numerous welcome appearances. The now-classic musical sketch featuring the gorilla-faced "Nairobi Trio" pops up too. If Ernie and his writers only make a half-hearted effort to squeeze some inconspicuous clues into these sketches, it certainly doesn't make them less entertaining. A few notable showbiz folks and celebrities find themselves in the secret guest mix, such as Clarence Nash (the original voice of Donald Duck), silent cinema pioneer Mack Sennett, Jean Darling of the original "Our Gang" shorts, Lost Weekend author Charles Jackson, actor William Bendix, chess master Bobby Fischer, a wry and self-effacing Leon Uris (author of Exodus), and even frequent panelist Carl Reiner, who appears with a bag on his head, while affecting a goofy voice that fails to fool the trio of inquisitors. This kind of program doesn't seem to naturally lend itself to the binging tendency of modern TV, but I found myself ravenously devouring the show in 4- or 5-episode chunks. Once you put yourself on Ernie Kovacs's oddball wavelength, Take a Good Look becomes downright irresistible and a whole lotta fun. The 49 episodes of Ernie Kovacs: Take a Good Look - The Complete Collection are presented on 7 DVDs. Episodes run between 23-27 minutes. 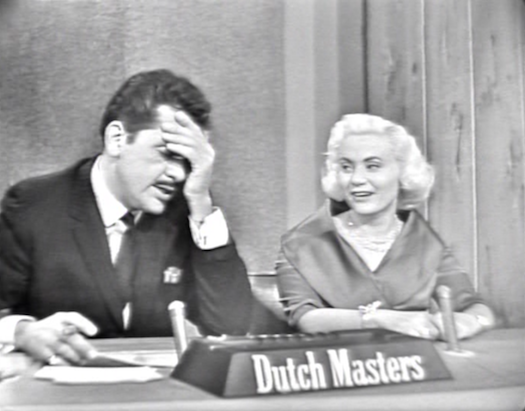 The difference seems to rely on whether or not Ernie Kovacs's self-produced ads for Dutch Masters cigars are included. Usually there is at least one of these ads per episodes, but not during all the commercial breaks. A short liner note essay by historian Ben Model is included in the set. It comes as no surprise to anyone that technology advances pretty quickly, so it shouldn't be a shock that these shot-on-tape shows from nearly 60 years ago are not up to today's standard. The standard 1.33:1 image can be soft and sometimes blurry. There are video drop-outs and other analog anomalies. Select sequences appear to have been sourced from tapes that have warped, impacting not only the image but making the Dolby 2.0 mono audio sound warbly as well. Otherwise, the audio frequently exhibits surface noise and hiss, but it usually doesn't overwhelm the banter being thrown about. Considering that these tapes were earmarked for the landfill by the network, one feels grateful to have them in any condition in which they can be enjoyed. None. But the show is treat enough on its own. 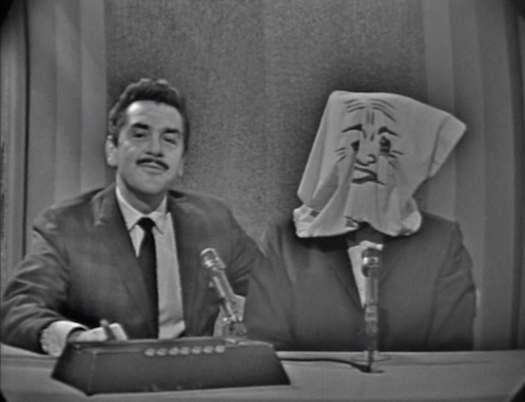 Granted, this is not necessarily the place that newcomers should start with Ernie Kovacs. Shout! Factory's other excellent sets are the obvious first steps. But once you've gotten used to Ernie's cracked worldview and off-kilter comic sensibility, then you can truly appreciate Take a Good Look. It's a wonderful, odd prank of a game show, where Ernie tests the patience of his celebrity panel to the potential puzzlement or delight of his audience. Totally unique. DVD Talk Collector Series.